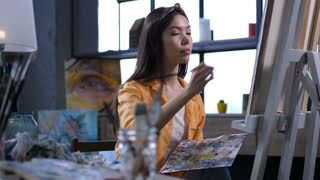 Close up portrait of a beautiful cheerful female creative artist smiling enjoying working on her painting at her Art Studio artwork creativity lifestyle relaxation inspiration concept. Urban artist is decorating column in abandoned warehouse with abstract image using aerosol paint. 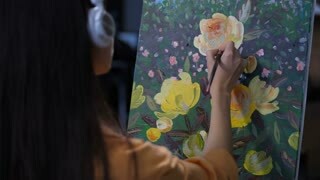 Girl is wearing casual clothing and listening to music with headphones. Modern graffiti painter is squatting near column in old abandoned building and painting graffiti with spray paint creating bright image. Creative people and art concept.